In the previous blog posts in this Crossref/SciELO series, my colleagues, Chrissie Cormack Wood, Head of Communications and Laura Wilkinson, Education Manager, introduced you to Crossref and the critical role of the DOI. 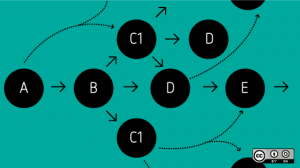 As a reminder, a DOI, or “digital object identifier”, is a unique, persistent, and resolvable link to a research output, like a journal article or book. 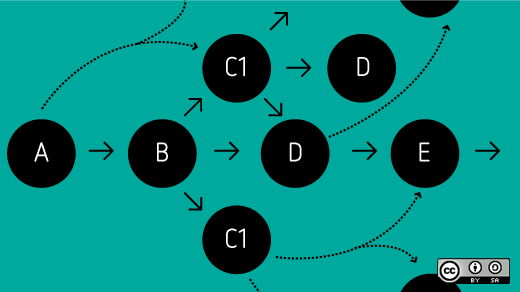 DOIs and the metadata associated with these persistent identifiers are the foundation for this blog series and our work. Improving the culture of communication within the scholarly community. As many of you may know, preprints, ahead of print, and versions of record are all intimately connected, but their practical differences necessitate technical differences in how we recommend you register and maintain the metadata records of each. Preprints are the original versions of a work that are submitted for publication consideration. They are often uploaded to a preprint server, like bioRxiv. Preprints have not been through a formal peer review process and have not been accepted for publication. These preprint versions may be free before (and sometimes after) the version of record, or accepted version of the work, has been published. Preprints receive a different DOI than the ahead of print and final published versions of an article. Ahead of print content goes by many names – “publish ahead of print,” “article in progress,” “article in press,” “online ahead of print,” or “online first”. Ahead of print articles have been through the formal peer review process and have been accepted for publication. They are often made available online with a Crossref DOI before being formally published. Ahead of print content shares a DOI with its corresponding version of record. The version of record is the final published version, and today most versions of record are electronic. Sometimes these final versions are corrected, retracted, or enhanced over time. The version of record is the most up-to-date record of the publication. One fundamental difference between preprints, ahead of print, and versions of record is acceptance. Because of this, preprints should have unique DOIs, while ahead of prints and versions of record share a DOI (the metadata associated with an ahead of print article will be updated and become the version of record upon final publication). While this practice of assigning unique DOIs to preprints does result in two DOIs for a related record—and some have expressed a concern with potential splintering of citations for similar or related work—the preprint is intended to be unique and should, by definition, have its own DOI. Since our goal as a community is open transparency of the scholarly record, then two unique DOIs for preprints and the version of record is the only acceptable registration practice. As I said above, if all goes successfully for you, the preprint article that was submitted to your favorite journal for publication will be accepted and will appear in print or online (as that version of record I talked about). From here, the XML for the preprint can be updated to interlink the two related works. When you’re reading and citing an article in a journal, the full story behind its journey to you may or may not be represented in the article’s metadata. Its story is only as complete as its metadata record. Often times many complementary pieces from different organizations form an article’s full story – from production, curation, publication, translation, and updating of the work. That full story almost always requires interlinking – for the benefit of you and me, as readers, and the machines that complement our work. Relatedly, figures, tables, and images can be assigned unique DOIs, as components of the article itself, improving their potential for use and reuse. Reference linking gave Crossref our start; you don’t have to look far to confirm that. We began by connecting articles identified in a bibliography to one another. Today that has become a rich, interconnected network of citations. And, we’ve expanded to other types of relationships. 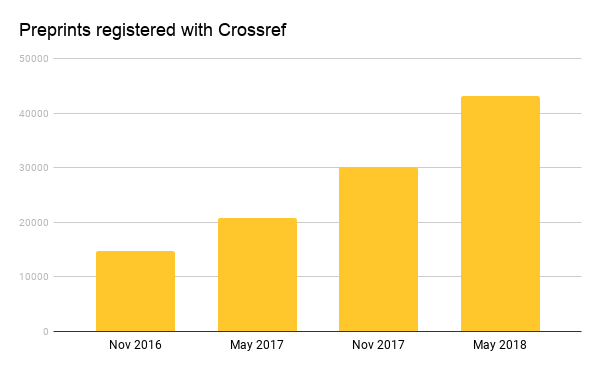 One of the newest ways we do that is through Crossmark, which builds a full story of a publication by recording its history of updates – from when the article was received, accepted, and published to how it was funded and its license information. All of these Crossref services allow us to build relationships between our content items and tell the fullest story possible of your work. 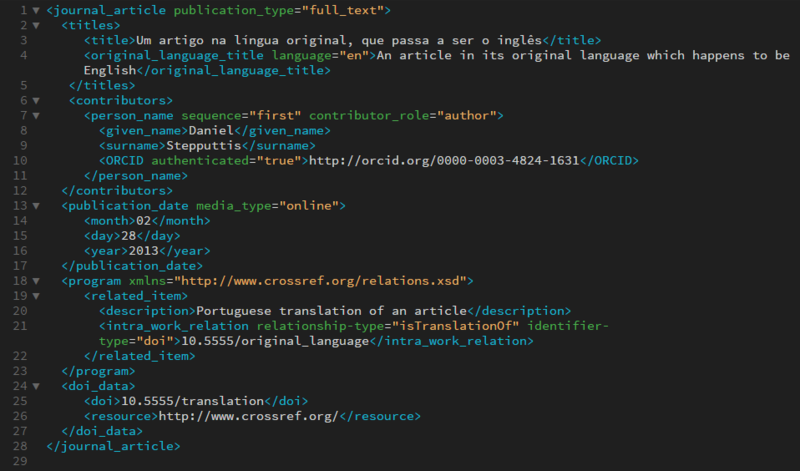 Below I have included examples of common relationship types and an XML sample of a translation. We recommend that translations of original works receive distinct DOIs and be connected by the “isTranslationOf” relation. Isaac joined Crossref as the Support Manager, part of the Member & Community Outreach team, in April 2018. Along with the rest of the Crossref support team, he spends most of his days providing our 10,500+ members around the world excellent support. Prior to joining Crossref, he worked for the Society of Exploration Geophysicists as their Digital Publications Manager. 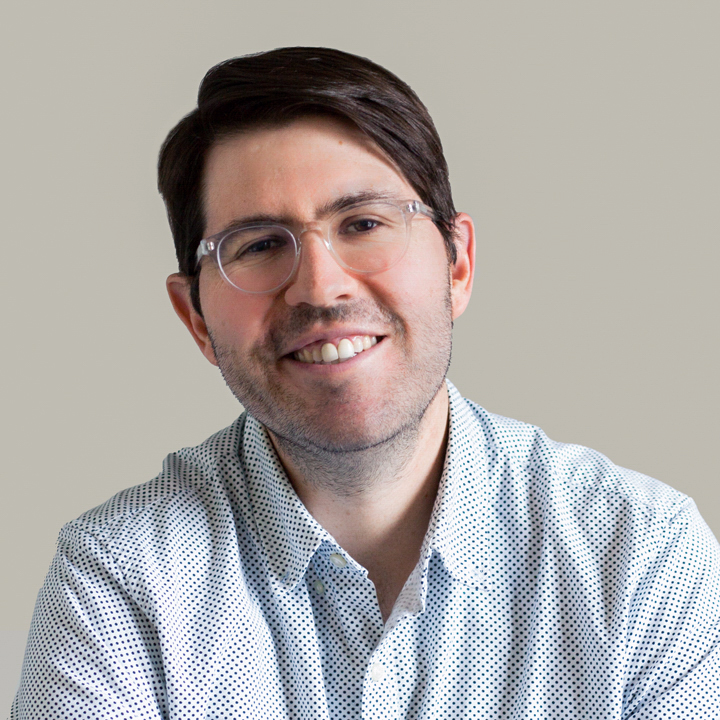 In addition to more than five years of experience in digital publishing, he has previous experience in community building, volunteer engagement, and education.